Adopted on May 28, 1919. 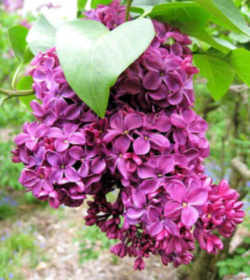 The purple lilac, (Syringa vulgaris,) was adopted as the state flower of New Hampshire on May 28, 1919. 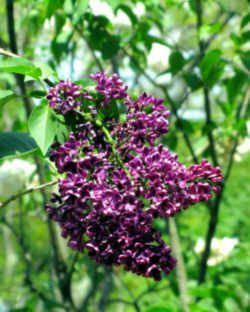 Purple Lilac is popular for its beauty and fragrance. New Hampshire historian Leon Anderson writes in To This Day that the purple lilac was first imported from England and planted at the Portsmouth home of Governor Benning Wentworth in 1750. It was adopted as our state's flower in 1919. 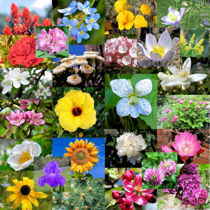 That year bills and amendments were introduced promoting the apple blossom, purple aster, wood lily, Mayflower, goldenrod, wild pasture rose, evening primrose and buttercup as the state flower. A long and lively debate followed regarding the relative merits of each flower. 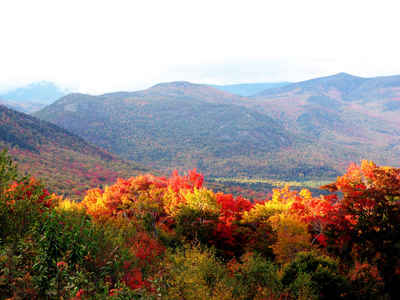 The purple lilac was ultimately chosen, according to Anderson in New Hampshire's Flower - Tree - Bird because it "is symbolic of that hardy character of the men and women of the Granite State." Syringa vulgaris (lilac or common lilac) is a species of flowering plant in the olive family Oleaceae, native to the Balkan Peninsula, where it grows on rocky hills. Leaf: Opposite, simple, broadly ovate, 2 to 4 inches long, 1 1/2 to 3 inches, heart shaped, entire, dark green to bluish-green above, lighter below. Flower: Light purple, pink or even white (cultivar dependent), fragrant, flowers in terminal clusters, 4 to 7 inches long, appearing in May. Fruit: Dry, brown, capsules, 1/2 inch long. Twig: Stout, angled (almost 4 sided) or ridged, lustrous brown, glabrous, numerous raised lenticels, leaf scars raised, crescent-shaped, buds large, green but turning purple in the winter. Bark: Gray to gray-brown, smooth but becoming finely shreddy when large. Form: A multi-stemmed, suckering, tall shrub reaching up to 15 feet in height. 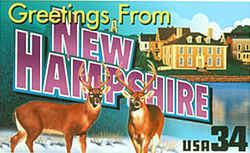 The law designating the purple lilac as the official New Hampshire state flower is found in the New Hampshire Revised Statutes, Title 1, Chapter 3, Section 3:5. Title I: The State and Its Government. 3:5 State Flower. - The purple lilac, Syringa vulgaris, is the state flower of New Hampshire. Source. 1919, 148:1. PL 8:3. RL 13:3.